The young actress Ellen Page is one of the influential Hollywood actresses. She became famous for her roles in Hard Candy, Juno, X-Men: The Last Stand, Inception, and To Rome with Love. Today, the artist has participated in many projects, voiced cartoon characters, and tried herself as a producer. Ellen Grace Philpotts-Page was born in February 1987 in Nova Scotia, Canada. She spent her childhood and youth in Halifax. The girl’s father worked as a graphic designer, and the mother was a teacher. The parents discovered their daughter’s talent early and took her to the school with an emphasis on drama. Ten-year-old Ellen Page debuted in the movie Pit Pony. The beginning was successful, and the young actress was invited to the series under the same title. She received her first prizes at that period. Page graduated from the Halifax Grammar School and studied at Queen Elizabeth High School for a while. Still, she decided to develop her acting skills at Vaughan Road Academy; her close friend Mark Rendall went there, too. Ellen Page continued to appear in movies in 2003: she was invited to three American projects. The audience welcomed the movies Homeless to Harvard, Going for Broke, and I Downloaded a Ghost and noticed the artist. The next year, the young woman took part the interesting arthouse movie Mouth to Mouth; it was 16-year-old Ellen’s first European movie. At 17, Page appeared in the drama Hard Candy. The movie provoked an outcry. Ellen’s character, a girl, meets a photographer and suspects him of pedophilia. She takes the man hostage and tortures him. Although moralists’ reaction was ambiguous, movie critics appreciated the project and the young actress’s skills. In 2007, Ellen Page’s career was developing rapidly. The Canadian appeared in the blockbuster X-Men: The Last Stand and the dramas An American Crime and The Stone Angel. However, it was Jason Reitman’s Juno that turned out to be the major project of the year. Ellen played a pregnant school student who was looking for good parents for her future child. The movie was a tremendous success and brought Page nominations for the Academy Award and the Golden Globe; she received many other prizes as well. At the beginning of the actress’s career, directors offered her the roles of intelligent, charming, and ironic school students. Later, they began to see her more adult. Ellen starred in indie and arthouse movies and personified various characters. She worked on The Tracey Fragments, Smart People, Whip It, Peacock, and Tallulah. The movie Inception starring Leonardo DiCaprio, Marion Cotillard, and Joseph Gordon-Levitt turned over a new leaf in the actress’s filmography. Woody Allen’s To Rome with Love was one of the most significant projects. Those who collaborate with Allen are destined to become permanent Hollywood artists; they gain their personal stars at the Hollywood Walk of Fame. In 2014, Ellen came back to the role of Kitty Pryde in the movie X-Men: Days of Future Past. The role of Stacie Andree in the drama Freeheld is an important milestone in the actress’s career. The movie is based on a true story and pictures Laurel and Stacie, two women in love. Suddenly, Laurel learns she is gravely ill. She starts fighting for the right to transfer the pension rights to her beloved one, but the authorities are against it because Laurel’s partner is a woman. Ellen collaborated with the Academy Award winner Julianne Moore; Michael Shannon and Steve Carell played the male leads. It is interesting that Page announced she was gay a year before the movie release. In 2016, the actress participated in the movie Tallulah starring Allison Janney. Page tried herself as a voice actress: the characters of Family Guy, The Simpsons, Window Horses, and My Life as a Zucchini. Despite her small sizes (the actress’s height is 155 cm. ), Ellen Page is a significant figure in cinematography. She not only was included in the list of the sexiest women of the world but also got famous for her brave opinions, sense of humor, and straightforwardness. The woman does not rush to move to Hollywood and prefers to reside in her native city with her favorite dogs. Ellen mentioned she did not want to follow Hollywood standards; she emphasized she wanted to be respected for her work. Page is a vegan and atheist. She supports pro-choice feminism that protects women’s right for abortion. The actress is fond of sports: she likes soccer, basketball, skiing, snowboarding, and swimming. In 2006, Page dated Ben Foster, but the couple broke up in less than a year. In February 2014, the actress made her point and delivered a speech at the LGBT conference coming out. In fall 2015, Ellen appeared at a festival in Toronto with her friend, an artist Samantha Thomas. The actress’s personal life was discussed at The Ellen DeGeneres Show; the artist said she had no regrets concerning her coming out. In January 2018, Page posted a photo on her Instagram where two hands with engagement rings were shown. 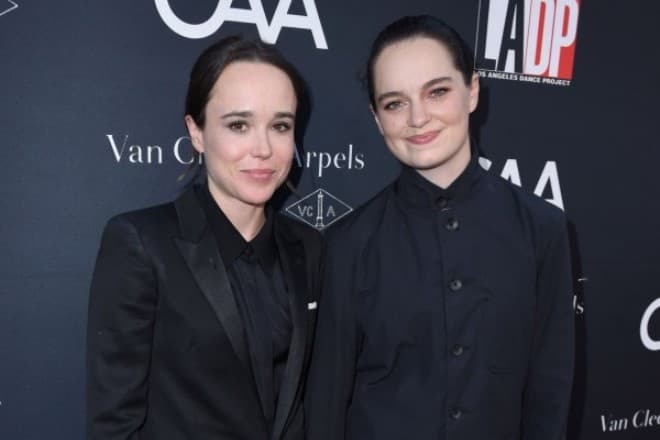 The photo was signed: "Can’t believe I get to call this extraordinary woman my wife.” Thus, the whole world learned Ellen Page married her girlfriend, a teacher and dancer Emma Portner. The same day, Emma posted a similar photo on her account. In September 2017, the audience watched Ellen’s new work in My Days of Mercy. The movie tells the story of two women who meet at the protest against the death penalty. Gradually, their friendship transforms into passion. At the same period, the actress starred in the thriller Flatliners where medical students decide to learn what is there, beyond death. Critics’ reviews were mostly negative. In 2018, the horror The Cured starring Ellen Page was premiered. As the story runs, doctors fight against the virus turning people into zombie monsters and find the cure that can bring back 75% of the population. However, these people remember all those savage actions they took. Despite this side effect, the government tries to socialize the cured, but some ordinary people are not ready to accept them. Ellen is going to appear in the drama Lioness and the fantasy series The Umbrella Academy. The biopic Untitled John Belushi Project is in the production; Miles Teller and Emile Hirsch will become Ellen’s stage partners. Later, Page will voice one of the characters in Robodog.